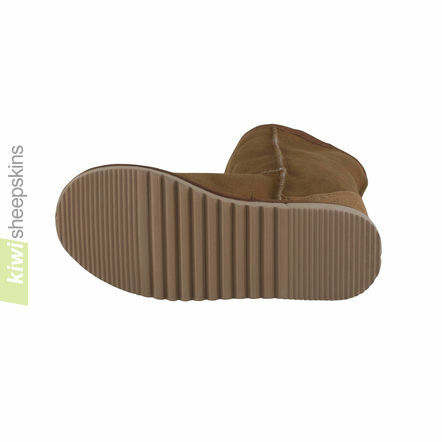 As always this lighter sole version of our mid calf sheepskin boots is made here in New Zealand only from premium double-faced sheepskins tanned specifically for footwear use. 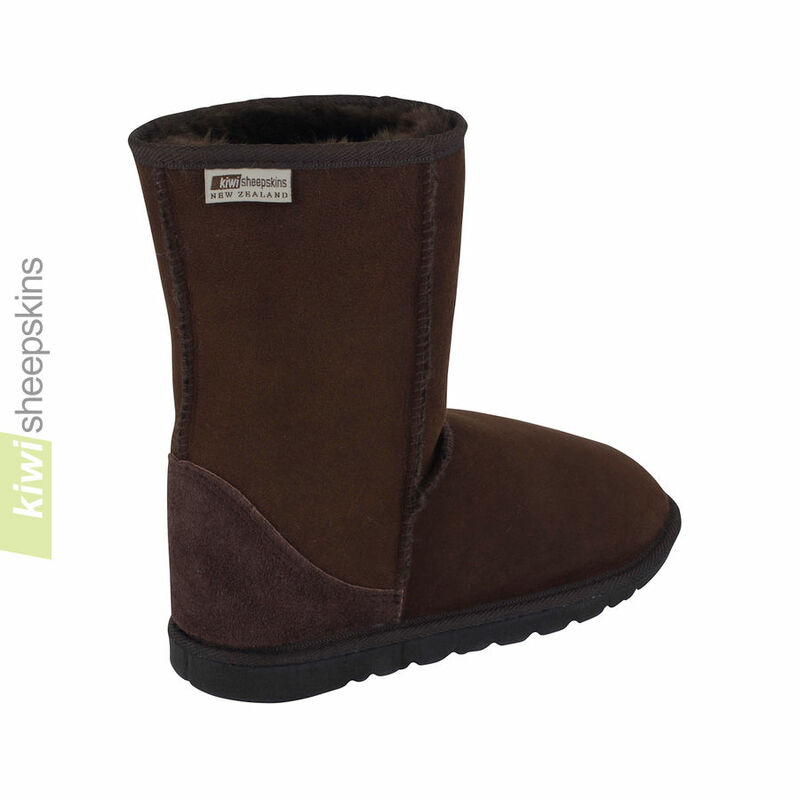 Made in New Zealand from premium-quality double-faced sheepskins that are tanned specifically to be used as footwear, these incredibly warm and comfortable sheepskin boots have a lighter sole compared to other mid-calf sheepskin boots. 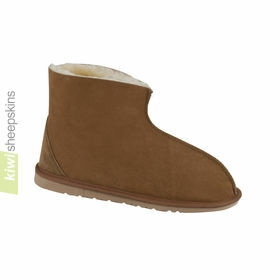 We've had so much positive feedback about these very popular sheep skin boots. I've had a pair of your sheepskin boots for some weeks now and I just want you to know that they're absolutely purr-fect!! I had Ugg boots previously but was dissatisfied with them as the quality was less than expected. Your boots exceed my expectations. Fit and comfort cannot be better and I'm very grateful to you for a fantastic product and service without peer. Just wanted to let you know how delighted I am with my new boots. Only 7 days from NZ to UK and they lived up to all the good reports from your other customers. 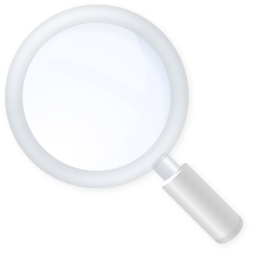 I did a lot of searching on the web before selecting to order from you. 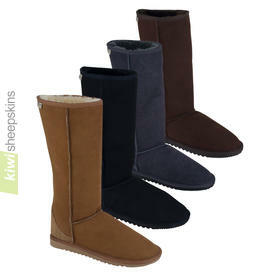 Having ordered I looked at Uggs in local retailers wondering if I had done the right thing. Absolutely! 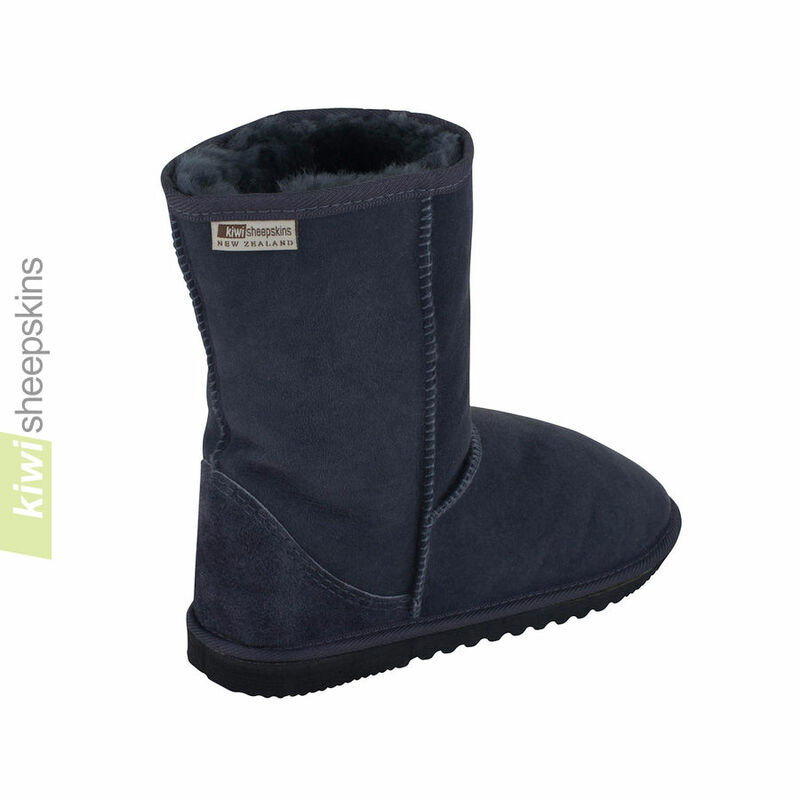 My Kiwis are well under Ugg prices but the quality of the sheepskin and the design could not be better. Also a perfect fit. I would certainly recommend your company to other people. Many thanks. I just wanted to tell you how wonderful my mid calf boots are. I don't want to take them off. I was worried about the size and when I first tried them on I thought they were too small, but after wearing them for a few hours they are perfect. My feet feel lovely in them. I don't wear socks as it said on the label not to, I thought my feet would get sweaty but they haven't. Fantastic and I will definitely be buying some more. 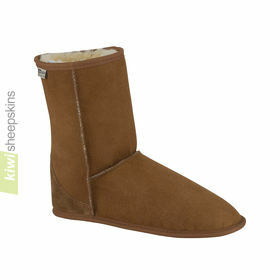 I received my sheepskin boots 27 Nov and have them on as I type this. If God had one pair of shoes in heaven, it would be these. I have chronic cold feet and my these boot eliminate that problem. Nice and toasty. I can not believe how fast they came from NZ. Thanks for the excellent boots and the fast shipment. Good to know that some things are NOT made in China. You guys rock. Just writing to say I have received my boots. I am delighted with them. 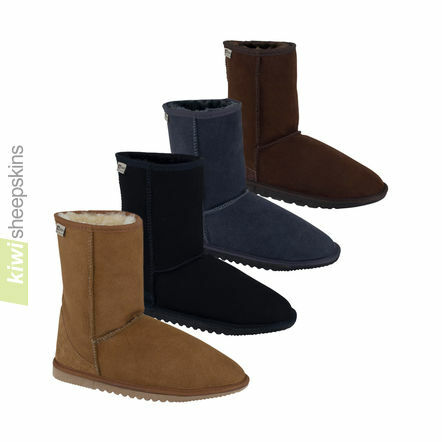 I have looked for sheepskin boots for ages as I refuse to pay the ridiculous price that UGG Australia charge. I will be letting my friends know. Thank you. I have ordered two pairs of boots from you. Both arrived within a week which is great considering how I have ordered items in the U.K. and delivery been much longer. This is my third pair and your boots have been a godsend during the recent bad weather the U.K. had this Christmas. I would recommend them to anyone. I wear them constantly and the quality is excellent. Much better than Uggs. Thank you. Wonderful service and product. We are again very happy with our boots!!!!! They are so wonderful. I have 8 pairs of sheepskin boots from different manufacturers (all Australian or New Zealand-made) and I have to say that your boots are decidedly the best. Thanks a lot for this high quality!!!! 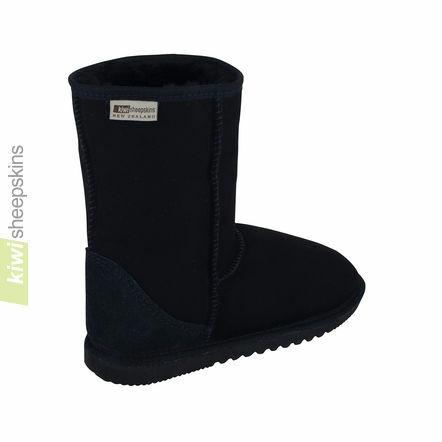 Hello and Thank-you so much, I received my black sheepskin boots and they fit perfect and are so WARM and COMFORTABLE. Thanks again for your professional prompt service. I am one happy little Kiwi even though I have been living in Australia for 20 years, New Zealand is where I grew up and I still call home, thanks again from one proud kiwi. I don't usually leave feedback when ordering but have been so impressed with my gorgeous EVA boots/the easy to use website and the amazing quick delivery within a week. I haven't taken them off since they arrived! My sister is jealous so looks like there's going to be another order on its way for her birthday! I just wanted to thank you for a speedy and easy service! Received my new sheepskin boots today and they are perfect! Since moving to Sweden, I have been looking for a new pair (which is essential for the winter here), and as a kiwi expat, I was overjoyed to find your website. My sister and dad still have boots from your brand which were purchased in NZ, which are now 7 years old and still going strong! So the quality is amazing. Thanks heaps, my feet are now ready for the long winter here. 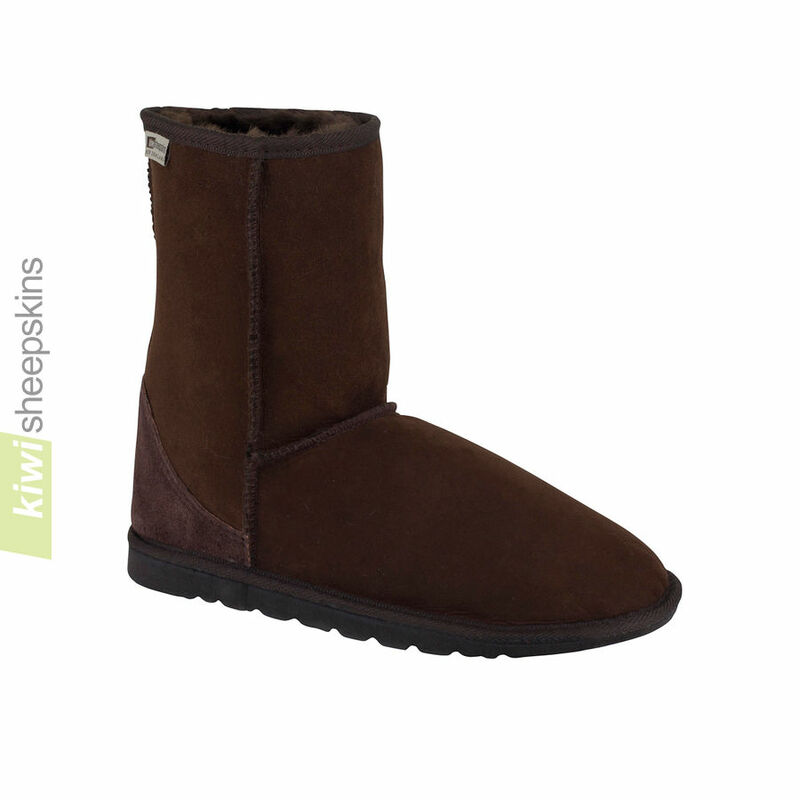 I ordered a pair of chocolate short ugg boots for my daughter, and we are both so pleased with them, great price for such a really well made product. I would have these any day rather than the more expensive version. Thanks so much. I want to thank you for the men's 9 boots. We are now coming out of Winter here in Reno, NV USA. I have worn these boots everyday since I got them. I was trying to solve a problem with cold feet, these boots sure did the trick. Now that winter in on the way out, I was kind of expecting the boots to get hot, but not so. They just stay very comfortable. I enjoy putting them on when I get home from work. People ask me if I live in them. Only when I am home. They work well for short trips to the market, or other short errands. Thanks again for a wonderful product and great service. 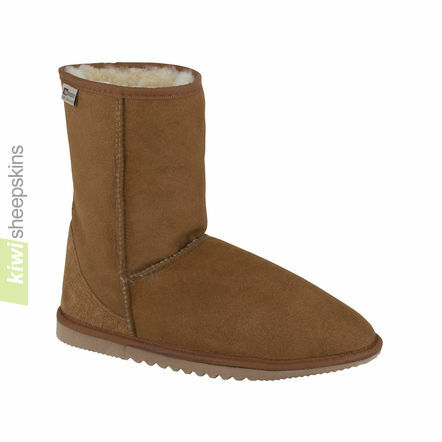 After reading about all of the fake sheepskin boots being sold online, many of which are seized and destroyed by Border Control on arrival in the UK, I was very wary about buying from the other side of the world. However your commendations from purchasers looked genuine to me and so I went ahead. The boots arrived today - eight days after purchase and during the Christmas rush and I am delighted. You may use this letter if you wish and I hope that it will re-assure anyone who, like me, was in any doubt. Seasons Greetings to your staff. Hi, I just wanted to say how fantastic my boots are! I ordered the Mid calf classic EVA boots in chestnut and they are perfect. I was very concerned about which size to buy, however I measured my foot and bought the suggested size and they're perfect! Lovely and warm. I have been recommending them to everyone I know, and I am desperate to buy another pair! I just wanted to say that if anyone else is concerned about the US mens sizes it was fine for me to measure my foot & order - the size was great! Many thanks all at Kiwi - boots and cleaner arrived today - love them as I love my other boots. You are well publicised at the school where I work. Great boots, fantastic prices and ultra fast delivery (it can take longer to get something posted in the UK!) Thanks again - I'll be back. I just wanted to say a huge THANK YOU for your superb service & delivery. I ordered my Mid Calf Sheepskin Boots 5 days before Christmas and was advised delivery could take up to three weeks - but they arrived on Boxing Day! I am absolutely thrilled and now browsing for more. I was SO close to ordering some original UGGS, but comparing your boots to my friends [original] UGGS, there really is no comparison - yours are FAR superior. I'm feeling rather smug :-) Thank you again - and you'll be seeing me again soon! 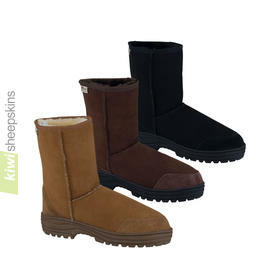 Thank you for the Mid Calf Sheepskin boots. They are just as described and very snug, durable and comfortable. Delivery to the UK took one week, as you expected. Thank you once again for a fabulous product and first class service. 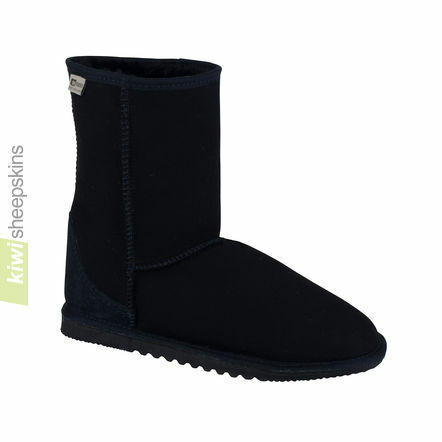 This is my third order from Kiwi and I love the boots, especially the long black pair. The mid ones I bought last Christmas are still going strong despite constant outdoor wear on the Eva soles. Best of all, after years of wearing layers of thermal socks and tights to winter rugby and soccer games, I can now attend these events without socks on and not feel the slightest bit cold. 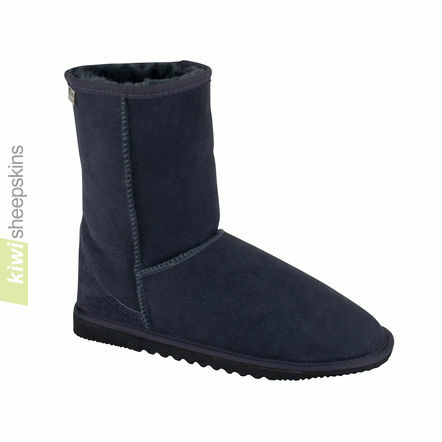 As a bonus, this style has suddenly become very cool over here: I work with teenagers who keep admiring my boots and asking where I got them from, assuming they are fashion copies, only to be amazed when I tell them they come from real New Zealand sheep!! Thank you for revolutionising my footwear. I will be back! I just wanted to say a quick 'thank you' for the excellent service and the fantastic boots which were received today! I am most impressed and won't hesitate to tell my friends about you - you're great!! Many Thanks.